Yes....but, I hit a wee snag...and it just doesn't fit all the way around right!!! !....so I will just have to get creative and figure out a way....cause I DON"T like to un-sew. Had extra crumb blocks and decided to make a quilted cover for my "Quilt Ideas" journal. Went antique shopping with friends a few weeks ago...and look what we found!!! This beautiful hand pieced Hexie top. "I promise Mommy...I will be a good girl!!!" LOL!!!! she is my good (big) girl...love here to pieces. I don't have any problem with cutting up an old quilt or quilt top. The makre got her pleasure from it and now it's going to make 3 people happy. Nothing wrong with that! Love the bow tie border on the crumb quilt too. The quilt is comming along just great, cann't wait to see it when it is 'FINISHED'. I know it was hard to cut up that find, put hay, new ideas are always great with old things. Looking forward to seeing the outcome. 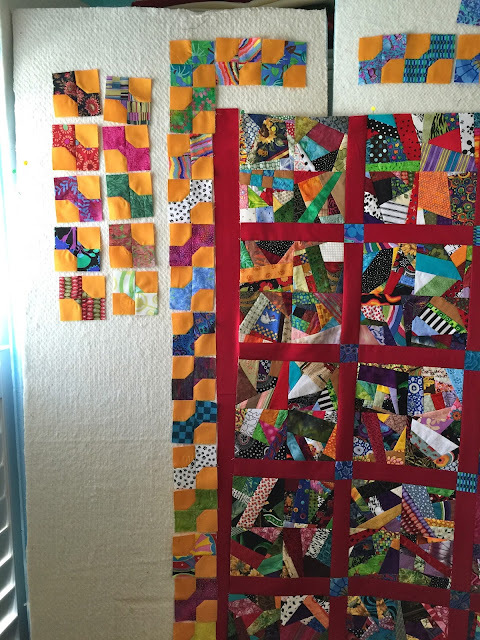 lLove seeing your quilt grow and grow! 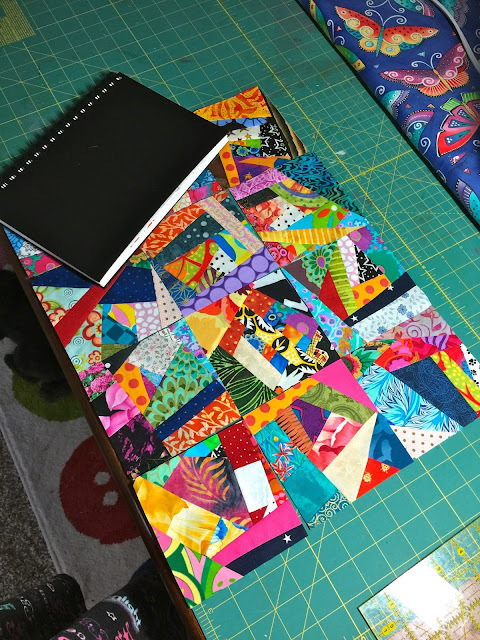 Your journal cover is amazing...your quilting is perfection! I saw a short YouTube video on a young woman making a crumb quilt. I haven't tried it yet, probably because I don't have a lot of little scraps from quilting. But maybe one of these days I'll give it a go. I love the extra crumb cover for your quilt ideas journal. It is gorgeous. You do such an excellent job of machine quilting. Everything looks so precise. 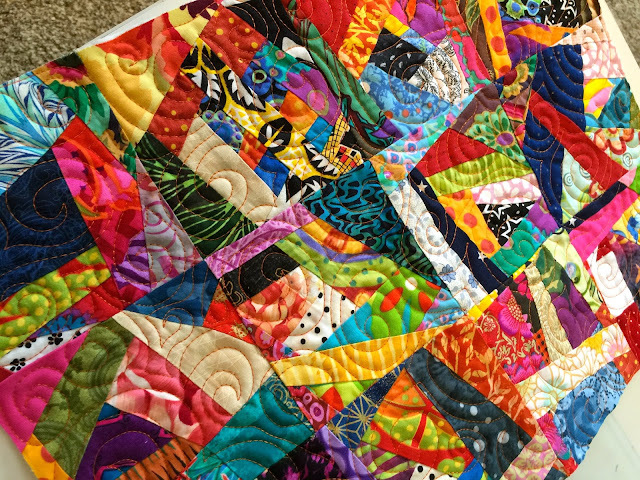 Does your sewing machine do quilting/embroidery? If not, how do you get the quilting patterns so neat and precise? I'm awed and amazed. Hope your mom is doing well. And you, too. I know you have the ankle thing coming up in July and will be watching for your progress. And I'll show progress photos in my new art journals. My summer art journal camp starts July 1 so I will have a great reason (aka excuse) to take photos and post on my blog. Your crumb is stunning and love your borders.Congrats on your beautiful finish. Crumb quilt looks great ESP with those cheddar bow ties! Can you trim the red to make the bow ties fit? Or maybe add another little border so it brings the quilt up to a multiple of the size of the bow ties. Your girl looks so intent on that cookie! Good girl! Love the blog update! I hired Karen at MyDesertCottage.com to update my blog late Fall of 2014. I'm looking forward to the WHERE BLOGGERS CREATE party in July. I have the photos taken - just need to resize and write a blog post for the party.